2001 was a tough year for me as I was going through my divorce. I had been married for 19 years and this was one of the toughest times of my life. In order to keep my sanity, I spent much of 2001 with Teams in Training training for the Dublin, Ireland Marathon. If you have never been involved in a running group, Teams and Training is a great group to become a part of. There goal is to not only help you to train for any run you wish to embark on but also to raise money for the Leukemia and Lymphoma Society. I chose this group because one of my closest friends Joye Salisbury struggles with Lymphoma and my goal was to run for her! That year one of the choices was to run the Dublin Marathon. How could I pass this up? Guinness and sightseeing in a beautiful country and of course training with a group that would help me to train right! Two weeks prior to the marathon, I got shin splints. Bad shin splints! So bad that I could barely run 1/2 a block without them hurting. I questioned whether I would be able to run the race. The beautiful thing about this is that I was taking my two older sons with me to Ireland, Craig (21 at the time) and Mitch (17 at the time). They were just going to watch me run, however given my condition I asked if they would be willing to run the marathon with me. I wasn’t going to be able to run so we would have a great time together walking and enjoying Ireland and the 26.2 miles together! They both had not trained (as they were just going to sightsee and support me) but they decided to join me in the marathon! One thing I am so happy that we decided to do was to take a couple of days together prior to the marathon to sightsee! We rented a car and went to Cork during the Guinness Festival as well as visited the Cliffs of Mohar- how amazingly beautiful! This was the first time any of us had been out of the country and we really did not know what we were doing but it was an experience of a lifetime, one that I will never forget! One thing I was afraid of on race day was that the kids would take off on their own and somehow get hurt as they had not trained and really had no clue what to expect and how to fuel themselves (even though I coached them beforehand). Craig had done some runs (5k’s) over the years and ran track so I wasn’t as worried about him and of course he wanted to run at his own pace..not walk! He saw this as a great challenge that he was going to accomplish! The gun went off and Craig took off. Mitch and I stayed by each other the entire race! We walk/ran the race. This is still very difficult if you have not trained. As a matter of fact at about mile 13 or so we really started to feel it and though several times of just going to one of the bars and sitting this one out. Then again, we had traveled so far and knew that we could finish this if we put our minds to it. At many points during the race our goal was to just run the block..we told each other ..we can run to that stoplight and then we can walk to the next one. It became rather comical even though we were both experiencing a lot of pain and discomfort. When you run with Teams and Training there are always coaches near you that are cheering you on and watching over you to make sure you are ok. Giving you goo, etc to make sure that you are well fueled and hydrated. The one question I always asked when we saw one of our coaches was “Have you seen Craig?” I am worried about him, is he fueling himself, drinking water? They said that they were watching over him and he was doing great. And yes, he was taking their goo! What a relief! I don’t think I would have felt this same way had I not been there with Teams and Training! Well we made it! Mitch and I came in at 6:24 and Craig came in at 5:30- which is absolutely amazing for a first marathon! I was so proud of both the boys for this huge accomplishment! One that I hope they will always remember! – Teams in Training- What a great group of folks! If you are new to running or want to be part of a community that cares, I highly recommend Teams in Training! Thank you for all that you have done to help me and my children make it through this marathon!! 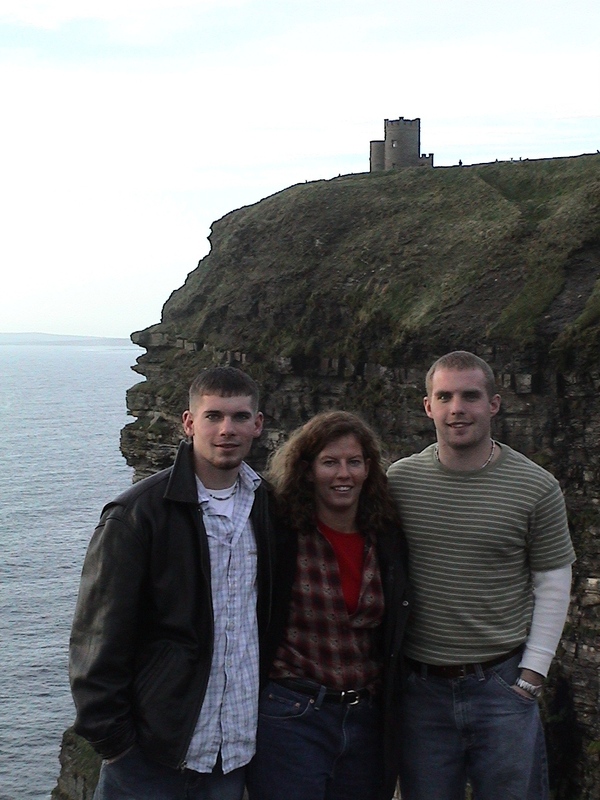 – Traveling throughout Ireland with my boys! Driving on the opposite side of the road on roads that really only one car should be driving on! Seeing the beautiful castles, getting lost, drinking Guinness, trying to find a hotel late at night when we arrived in Cork as we really didn’t plan ahead! Men in kilts- uh ohh!! – The excitement on my boys faces at the start-line! They knew that they were definitely going to accomplish something that they never would have signed up for by themselves! – The 26.2 mile journey with Mitch. Laughing, Swearing, Telling Stories, – just an amazing time that I will always cherish! – The finish- Looking for Craig- Still worrying about him and then finding out he made it in 5:30! Traveling back to the hotel- starting to feel the pain set in! So Proud of these boys!!! – The trip home. Going to the airport, waiting all day for them to tell us that our plane had mechanical problems and that we would have to go back to hotel and come back the next day. The next day arriving and waiting half the day and them telling us that there were still problems but that they were going to turn off the air conditioning on one side of the plane and change their flight path so that we would always be over land in case any issues. Crying before I got on the plane, wondering if we would make it home. Looking at Craig and Mitch and then telling me to just get on, it would be ok ( I was one of the last people to board). – Making it home- Cherishing the memories that can never be taken away from me! This entry was posted in Family and Running and tagged Dublin Ireleand Marathon, Family Running by TwogetherRunners. Bookmark the permalink.